Forty-two years ago, the 26th Amendment to the Constitution was ratified. This amendment ensures that both states and the federal government will not be allowed to raise the minimum voting age (thus guaranteeing 18 year old people the right to vote). 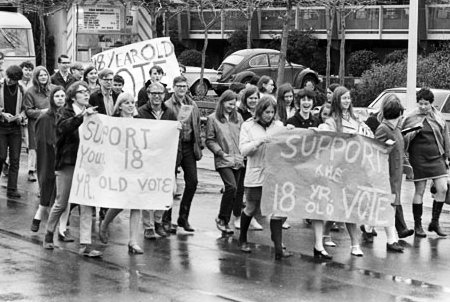 While some people may think that the 26th Amendment was the first and final step in lowering the voting age, in actuality the story of lowering the voting age is a bit more complicated than that. When the Constitution was ratified in 1787, qualifications and voting eligibility rules were absent and reserved to the states. In the early years of the Republic, most states had stringent voting requirements which excluded the majority of the populace from voting. The early electorate was small and limited to adult white male landowners. Throughout American history, voting rights have been expanded by both state and federal action, including prominent amendments to the Constitution. “Of the 17 constitutional amendments passed since the Bill of Rights, five have focused on the expansion of the electorate.” The Jacksonian Revolution eliminated property requirements for white males, and subsequent amendments gave African-American males, women, and residents of the District of Colombia the right to vote. In 1964, poll taxes were eliminated via the Twenty-fourth amendment, thereby ensuring impoverished Americans had an equal right to vote. The Twenty-sixth Amendment (which is also the last amendment related to voting rights) was ratified four months after its 1971 proposal. The Twenty-sixth Amendment ensured, “The right of citizens of the United States, who are eighteen years of age or older, to vote shall not be denied or abridged by the United States or any State.” While such rapid ratification is unusual, recent historical events provide a clear explanation as to why such a sweeping change in both states rights and voting rights was approved with relative ease. Coats-of-Arms: Where did they come from and why?